Seems I’m going backward in time, since the last two weeks I reviewed Thanksgiving books and today I’m reviewing a Halloween book! This book wasn’t at the library when I wanted it, but now I have my hands on it just in time for Halloween. Synopsis: (from publisher’s website) It’s Halloween, and Simon Lester Henry Strauss and his friends make their way through a haunted house filled with creepy creatures. Although his friends are running scared at every turn, brave Simon Lester is not afraid of anything. He handles the Vampire’s Feast, a one-eyed monster, and the Treacherous Tower with tremendous bravado. That is, until he finds himself taken by surprise. and I’m not afraid of this haunted house. My friends are scared of what they’ll see. But I just tell them, “Follow me! I’m not afraid of the witch at the door. I’m not afraid of the creaky old floor. Resources: This page (HERE) is full of craft ideas for making haunted houses. 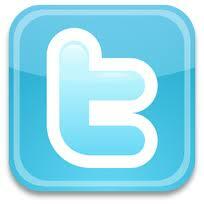 I have singled out a couple of links, but there are several more. The ads are annoying, but the seeing the ideas made it worth putting up with the ads. 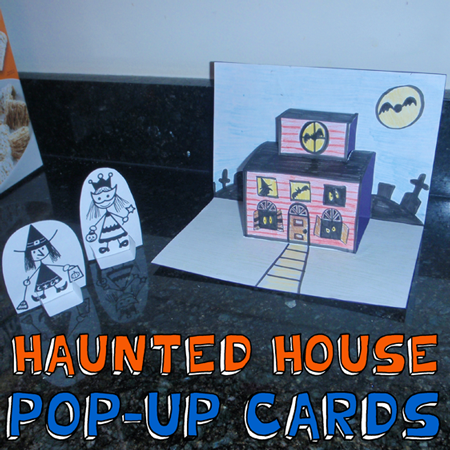 HERE are instructions for a Haunted House Pop-up Cards. 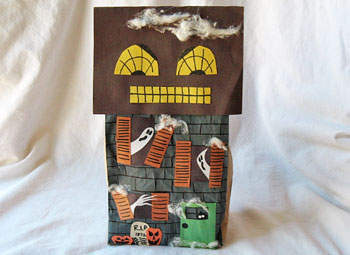 HERE are instructions for a Paper Bag Haunted House. This book would be a nice lead into discussing fears. Why I Like This Book: Combine Halloween, humor, and rhyming text, and you have me hooked. This illustrations are delightfully creepy and perfectly paired with the playful text and the repeated boast of Simon Lester Henry Strauss—“I’m Simon Lester Henry Strauss and I’m not afraid of this haunted house.” Throw in the fun surprise at the end and you have a book that begs to be read during the month of October…and, most likely, every other month of the year! This looks like a fun book! And yes, Penny and Cathy, you are both right- there are more rhyming books and they do have to see good rhyme. There was a brief trend back in the late 80’s, early 90’s when publishers were rejecting rhyming books-probably because they were inundated with bad stories written in bad rhyme (or even good stories- bad rhyme will not redeem a good story- and vice versa). But now, in this competitive field, authors are doing their homework and the caliber of rhyming books has improved. Rhyming books are so appealing to children and they help them to learn to read! Hooray for rhyming books! Thanks for your comments Iza! That is what I had gotten from reading on the Internet and listening at the two conferences I have been able to attend. But it’s great to hear it from you-a successful rhyming author. And yes…Hooray for rhyming books! The cover had me! Great classroom book for Halloween. Love the rhyming. You pick unusual books! Great choice! Thanks for stopping by, Patricia! I agree that it would be great for the classroom. I think it would bring out creativity in students as they worked on Halloween art and crafts. 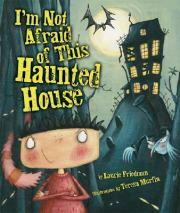 This sounds like an awesome Halloween book! 🙂 I like the cover! 🙂 AWESOME activities! Yes…those haunted houses would be fun to make. It would be cool to make a Halloween village with them. This sounds like a great class read aloud. Thanks. This looks like a fun book, and I’d love to know what the surprise ending is! I am going to have to try those activities myself — they look fantastic! The surprise ending is great! Very funny. The haunted houses would be really cute to decorate with. I love this. The rhythm of it is cool. I also adore the crafts. My kids will be psyched! How FUN this book looks. And I love the pop-up card. Thanks for the suggestion. I did too. Pop up crafts excite kids!! It’s a little “action” with the craft!!! I don’t much like creepy books, but this one looks pretty cool. I like that name – Simon Lester Henry Strauss! It has a good rhythm to it. And I love rhyming books! Cool craft ideas! Looks like a fun Halloween book. I did love the crafts. There were a lot out there, but this link had so many cute ones that I thought it was the best. Kids would have so much fun personalizing their haunted houses. I think I may try one of these activities myself! Thanks Penny – book looks like fun too. I know!!! They look like so much fun! What another fun one for Halloween. This is very cute. Really, really cute book! I hope your library has it. Ha! You’ll have to read the book!!! It’s cute & funny! I loved the crafts, too! Great rhyme and I love the protagonist’s name. This is great timing for the 31st! Me too…just saying Simon Lester Henry Strauss makes it worth reading the book! This looks like a fun one, Penny. I’m glad you finally got some Halloween books. 🙂 I love the opening lines. Well, actually…I had to buy the ebook! And I learned that I’d MUCH rather spend my picture book money on the real thing! But it is a cute book so I’m glad I have a copy…even if it is the ebook. What a fun Halloween book. Am I noticing a rhyming come back? There seems to be a lot of books in rhyme out now. This was published in 2005, but in my opinion…there are lots of rhyming books being published still! I think they just have to see really good rhyme.